Mapala.net – the future belongs to people's companies! We continue to acquaint you with the Mapala team members. Today's post is devoted to a very interesting man, true professional in his field. 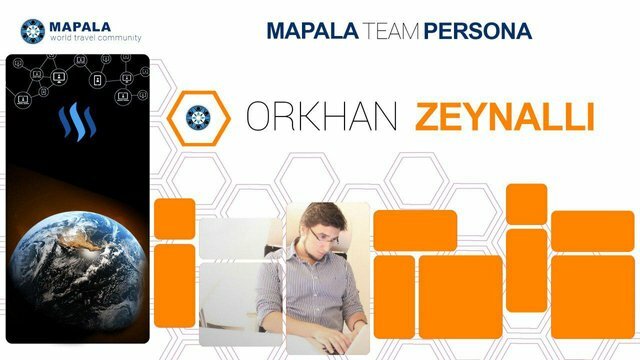 Let me introduce the project's CTO (chief technical officer) Orhan Zeynalli to you. – Hi, Orhan! It's our tradition to ask our interviewees to tell few words about themselves. Who are you? Where do you come from? Where did you study? – Hi, Dmitry. I am from a beautiful sunny city Baku, Azerbaijan. I studied in Baku, I won and took prizes at academic competitions on information technology, English and geography (one of the reasons why I got interested in Mapala). This year I plan to finish the Project Management training at the University of California. I have been involved in this field for more than 10 years by now. I really like everything that is connected with IT since childhood. When I was 9, I started to understand something in coding; when I reached 11, I worked in technical support services of large European IRC servers carefully concealing my age. I couldn't make any money because I was too young, unfortunately there was not such a thing as cryptocurrency back then, and my parents were conservative and thought skeptically about such kind of income. Later, I got interested in creating WAP sites, those days WAP sites with free polyphonic melodies content and dating services (oh, nostalgia) were very-very popular. Then my field of interest involved the creation of a different kind of software on Delphi and so on. – Very impressive. I can say that you are an early developer and child prodigy. When you were little, you already knew how to code, and even worked in a server's technical support – frankly, not everyone can brag about such things. And how did you find out about Mapala? And what were your first impressions? – I started digging in blockchain technology and cryptocurrency in 2015, and since then I've been carefully monitoring the products on the market. I saw once the ad that Mapala team was looking for programmers and wrote to the management, we met, decided to cooperate and make the world better together. The first and next impressions were excellent, there are not a lot of worthy job offers on the market, most of the times they come from studios, each of them states that it is not like the other one. But there are not many studios that are actually good, and routine work hinders personal and career growth, although for beginners it can be an excellent place to find their feet. In Mapala there are no trivial tasks, and it's unlikely that they would be. – I totally agree with you, routine and triviality – this is definitely not about Mapala. Tell me please, what are your main functions in the project? What tasks do you need to accomplish in the near future? – The first task that I had at the beginning was to arrange the production development process right through implementing the proper, as I think, methodology, and also to help the product team to set the roadmap from the position of technical implementation, so they could understand what to do at the moment and what to leave for later. There are many other duties on my plate, for example, I should organize the technical team, choose technologies that will be used, form the architecture and so on. At the beginning of any project, it is very important to have every team member motivated to do everything that he can, so I do not limit the range of my duties and demand it from every member of the technical team. We have only one task for the near future – to release the product beta version for our users and investors, and since we have everything under control and stay in combative mood, the day of release is just around the corner. The market certainly lack serious players - those who will use the newest technologies where they have not been used yet. And we have a very clear implementation plan for this, which is already launched and after the release of the first beta, we will start to disclose information to our readers by little portions. – You're right, the market does not have enough serious players, and this is a good opportunity for the Mapala team to create a cool product using the capabilities of high-tech technologies. The product that has actual value for a wide audience. Have you ever worked in start-ups before? Are there any tasks that you never had before you started working in Mapala? – Yes, I worked, and more than once, moreover, I occupied very different positions. I was a technical manager, product manager, business analyst. Many experts are afraid of start-ups, because they are often not stable in comparison with large companies, but I have a different position in life: a good specialist will always have a job, and unemployment is what weak people are afraid of. I love startups and totally against working for large corporations, I have already rejected the job offer from Microsoft in 2016 and I do not regret it. There were some technical issues about blockchain that were new for me, but it was not difficult to sort them out. I am always happy with doing something new, because it leads to growth. – Wow! It's very bold to reject a proposal from a company like Microsoft! Many people would not understand you. But I get this. That is right, the future does not belong to big corporations, but to people's companies, and this totally get in line with the ideology of Mapala. If it's not a secret, which position did they offer you in Microsoft? – It's not a secret at all – Senior Sales Engineer in B2B. My friend and I had our own business, we wanted to establish a high-quality IT engineering company and we needed to create a sales department, and since I myself knew the processes from A to Z better than anyone, I became a head of this department, the business started growing, and Microsoft wanted such a person to boost sales of their cloud products in our market. I passed an interview just for the fun of it, and the next day they assigned the first working day for me, to which I refused. And yes, many people still do not get my decision. – Tell me please, is it difficult to run the process from a distance? Or maybe you've done something similar before? How different is it from the usual format when everybody works in the same office? – Remote work is not for everyone, because some people can organize themselves only in an office environment, but everything is fine with my discipline, and I've been working like that for a long time. There is only one difficulty – to collect disciplined and responsible people like you around, and then there will be no problems with it. You save a lot of time on transportation, there are no distractions. For example, if you are distracted by a colleague in an office, you have to answer to him, and at that moment you could easily be solving a responsible task; such cases only confuse the focus and thoughts and interfere with the work. That is why, I vote for remote work with my both hands! On the other hand, if my colleagues actually need me to be in the office physically, at any moment I will pack my bag and move, I told it in the first day in Mapala. – Your mood and readiness for self-giving are encouraging! It is a great example for the rest of the team. Orhan, you came to Mapala about a month ago. Can you share your impressions of the project, its ideology and goals with our readers? – Most of all I was impressed by the scope of the project and its prospects. Decentralization and cryptocurrencies are the future, and the way this develops perfectly demonstrates the veracity of these words. The Internet has become way more popular than television among almost all young people, and cryptocurrencies are growing at incredible rate. One thing always replaces the other. The idea of Mapala is to change the traditional method of travel, and implementation of this is not a dream, it's only a matter of time! Actively developing technologies in the world just have to change the world. – Implementation of this is not a dream, it's only a matter of time!' Indeed, it is hard to find a way to put it better. You're right the future is very close, it does not even knock at the door – it's on the threshold. Orhan, thank you very much for finding time for the interview in your busy schedule, it was extremely interesting and informative! I am very impressed by your enthusiasm, approach to work and vision of the project's prospects. I am sincerely glad that such high class specialists join the Mapala team. Thank you for being with us! I think we will have many conversations like this in future. I'm sure that our users want to know about the project's progress and the innovations being planned. See you! – Thank you, Dmitry, for interesting questions. I'll be happy to talk in a similar format again. See you!